Online and blended learning environments have the potential to offer students opportunities to develop and consolidate their mathematical skills and knowledge through low stakes formative practice. Course coordinator of a Second year Mechanical Engineering course Dr. Lei Chen, wanted to explore whether it was possible to create questions using random numerical variables and formulas in MyUni. The goal was to allow students to have multiple different attempts at the same key concept questions, enabling extended practice while enhancing quiz validity and security. Dr Chen had created similar questions in previous years in another platform and wanted to do the same in MyUni using the Canvas quiz engine. As part of the action plan following a PEP (Program Enhancement Partnership) Workshop, John Murphy (Learning Designer) and Kym Schutz (Educational Technologist) succeeded in generating these sample questions using numerical variables and formulas in MyUni (Canvas). Below is an outline of the process, with examples from different disciplines and links to further resources. Create a quiz in MyUni. 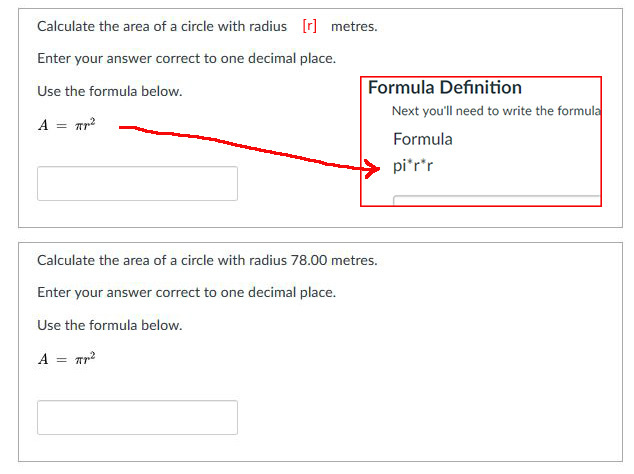 Choose ‘Formula question’ from the drop down menu. Enter your question text and use [x] and [y] where you would like the variables to appear. Define the parameters of x and y in the text boxes that appear underneath. Choose the number of decimal places to display in each variable, and in the answer. Enter a formula in the text box below this using the x and y variables. Auto-generate a range of answers. Set the quiz to allow multiple attempts and record the highest score and monitor student progress via the MyUni Gradebook. For technical support in creating questions with random variables and formulas in MyUni, please contact 8313 3000 (MyUni Support). The example below uses a formula for the area of a circle. The first image shows the variable and formula. The lower image shows what the student will see when doing the quiz. A different value for the radius is generated each time, and Canvas automatically calculates and marks the correct answer. For more specific examples of questions that can be created using the above method with the Canvas Quiz tool, (in a range of subject areas) see Advanced Quiz Techniques in MyUni Learning Centre. This entry was posted in Peer adoption, Teaching and Learning. Bookmark the permalink.